The Boy Scouts of America designates the Sunday that fall before February 8 (Scouting Anniversary Day) as Scout Sunday, which is the primary date to recognize the contributions of young people and adults to Scouting. This year, Scout Sunday is celebrated on February 3rd. If you have images that you would like to see posted here, email them to terry.luckett@comcast.net with a description of your event. The Catholic Committee on Scouting will host “Trail of Churches” on Saturday, March 2, from 8:45 a.m.-2:30 p.m., to provide local Girl Scouts, Scouts BSA, American Heritage Girls, and Trail Life USA members an opportunity to tour historic Catholic churches in the Nashville area. The tour will begin at St. Mary of the Seven Sorrows, and will then proceed to Holy Name, followed by St. Patricks, and Cathedral of the Incarnation. The entire group will gather for a short reception at the end of the event. 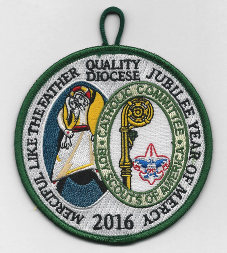 All registered participants will receive a Trail of Churches patch. Carpooling is suggested. All age levels, K-12 are welcome. Scouts are asked to come in uniform (Class A for Boy Scouts), bring a sack lunch, and be prepared to walk. All times shown below are approximate and subject to change up until the day of the event. Early discount registration (through Feb. 23, 2019) is $7/Scout, $10 after the 23th but prior to the event and $15 the day of the event, and for adults who also want a patch. Registration will be taken by emailing Brandi.laporte0413@gmail.com. "What a treat - Boy Scout Catholic Unit Troop 418 Holy Family Catholic Church, Brentwood, TN with Scoutmaster Andrew Rittler visiting Roman Catholic Diocese of Nashville Director of Scouting Emeritus Harvey W. Carter on Sunday, January 27, 2019 at his residence". - Doing. A. Good. Deed. Daily. Greetings Diocesan and Regional Committee Chairs and Chaplains! You and your Catholic Scouting committee members are invited to join us at Florida Sea Base for the Scouting in the Local Church "Diocesan Committee Development" Conference in the Florida Keys March 5-9, 2019. The course covers pertinent topics related to the successful operation of your Diocesan Catholic Committee on Scouting including effective committee organization, leadership recruitment, NCCS resources, marketing our Catholic Scouting programs, youth ministry and much more! Please spread the word and encourage committee chairs, committee members and others interested in Catholic Scouting to attend and enjoy a few days of faith, fellowship, fun and learning! Visit this link for more details and to register! Don't delay! Register today! Please note--we do have a program for Spouses/Guests as well. 2) Go to the Dolphin Rehabilitation Center, lunch and then the Turtle Habitat. 3) Paddle boarding or kayaking at Sea Base.. Questions? Please contact Course Director Kathy Polowski at kpolo55@gmail.com or call 480-244-6806. Please leave a voicemail if there is no answer. Posts may also be viewed on the NCCS Facebook page. We hope to see you in Florida! The National Catholic Committee of Trail Life USA is composed of representatives from each region of the country and is advised by several members of the clergy. The National Catholic Committee hopes to develop regional Catholic committees in 2015. All involved in the Catholic Committee's work find merit in the methodologies first popularized by Robert Baden Powell, yet each also believes that a rugged outdoor adventuring program cannot claim to instill virtue, foster character, and teach leadership without also remaining faithful to the traditional teachings of the Church. A Bible-based religious emblems program for Protestant and Independent Christian churches designed to bring children, youth and families to Christ. The mission is grounded in the U.S. Bishops' document, Renewing the Vision (RTV). RTV gives a solid foundation for a comprehensive youth ministry, a roadmap, and a vision that allows each diocese and NFCYM to animate ministry to to the young church. The Quality Diocesan Committee award is to recognize those dioceses that promote and achieve a quality Catholic Scouting program. It is an opportunity for the NCCS to salute those dioceses who truly deliver exceptional programs to youth members at all levels of Boy Scouts of America programs. Quality programs for youth are what the NCCS continually seeks, and is committed to supporting this goal. It is our hope that each diocese will establish annual goals to accomplish key areas of quality program delivery. Then, when a diocese earns this award, it makes a statement that they have provided their youth members with the highest quality program experience possible. Nashville, Tenn. - The Diocese of Nashville Catholic Committee on Scouting hosted the “Trail of Churches” Saturday, March 4th to provide local Boy Scouts, Cub Scouts and Girl Scouts an opportunity to tour historic Catholic churches in the Nashville area. Click on any of the above images to enlarge and download. The "Trail of Churches" takes registered and paid participants on a carpool motor tour to 4 Nashville historical Catholic Churches beginning with the participant's house of worship to obtain Passport signature stamps to earn a "Trail of Churches" patch. The participants experienced a pilgrimage procession from one Catholic church to another Catholic church starting with Cathedral of the Incarnation. Next they traveled to St. Mary of the Seven Sorrows. After a brief lunch break there was a visit to the Church of the Assumption. The last stop was a visit it to Christ the King where everyone had cookies and lemonade after the visit. "We are a welcoming group that encourages our Scout Leaders to guide our scouting youth in their faith. To be the guiding force of Catholic scouting as youth ministry; fostering personal and spiritual growth, providing opportunities for full participation in the faith community and empowering young people to become disciples of Jesus Christ."